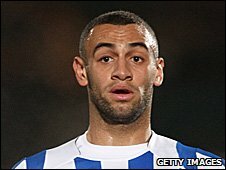 Chesterfield have signed striker Craig Davies from Brighton & Hove Albion on a free transfer. Burton-born Davies, 24, has signed a one-year deal with the Spireites. The Wales international started out as a Manchester City trainee before moves to Oxford United, Verona, Wolves, Oldham Athletic and Brighton. Davies scored seven goals in 24 appearances while on loan at Port Vale last season. He has also made five international appearances.